A variation of this recipe appeared in Martha Rose Shulmam’s Recipes For Health column in the New York Times. Martha does an amazing job of transforming familiar, everyday ingredients and I aspire to cook like her. Here, sweet potatoes and apples come together to make a casserole fancy enough for any holiday table. A food processor makes this recipe quick and easy. Makes eight servings. 1. Heat the oven to 375 degrees and grease a 2-quart baking dish. 2. In a large mixing bowl, beat the eggs with salt 1 teaspoon of salt, then stir in sweet potatoes, apples and garlic. Pour the lemon juice over the mixture and add the flour; combine well. 3. Transfer everything to the prepared baking dish. Cover the dish tightly with foil and place in the oven. Bake 45 minutes. Remove the foil and brush the top of the kugel with melted butter. Return to the oven and bake for another 15 to 20 minutes or longer, brushing with butter every few minute. 4. 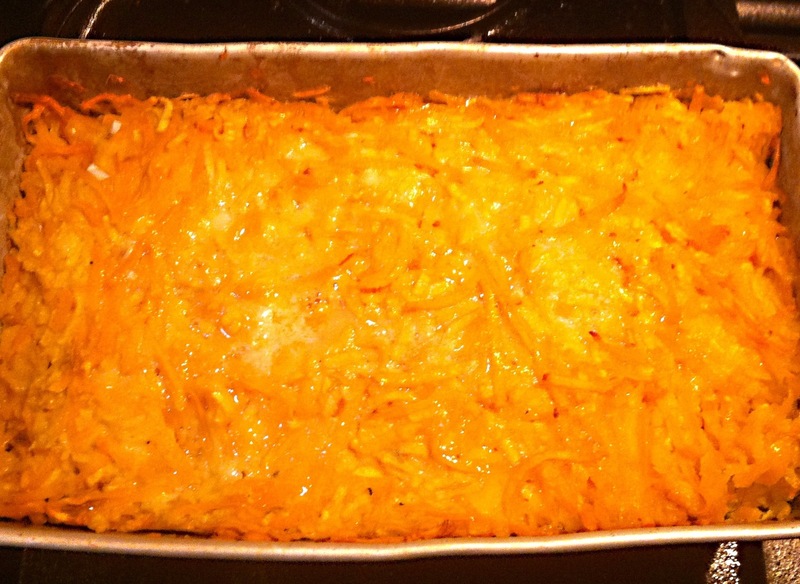 The kugel is ready when the edges are browned and the mixture is set. Remove from the heat and allow to cool for 10 to 15 minutes before serving.